The following has been reposted with permission from Steve Howard a.k.a. @AngryAnalytics. I have made some formatting changes but the content is unchanged. Thanks again to Steve for allowing me to repost this content. You can find the original post and the rest of Steve’s great work on his blog. As Power BI adoption in your organization grows, it becomes more and more important to be able to track the activity in the environment. When you start to think about deploying a Power BI Audit Log solution that is repeatable there are a few challenges that you will face. Based on these factors, i have put together a PowerShell script that can be scheduled on a nightly basis that can iterate MORE than 5000 records so that no data is lost. Also, the screenshot below is of an initial template that you can use to start with to analyze your audit logs for your organization. Use Task Scheduler to schedule the PowerShell script to run each night at midnight (run as admin). In the PBIX file, it was challenging to get a parameter to work for the file location that the CSVs are in, so in the Query Editor the script for the AuditLog table needs to be manually modified to include your file path. First, there is a PowerShell script. $User = "<<enter o365 admin user email here>>"
The Do/Until loop handles if there are more than 5000 records in the result set which would easily be the case for a large Power BI community. You can use Task Scheduler to run the above PowerShell script every night at midnight. 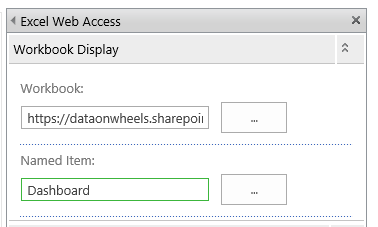 In the Power BI file, we are connecting to the content of the entire folder shown above. I went ahead and included the PBIX file WITH the sample data so you could get an idea of what your data may look like. 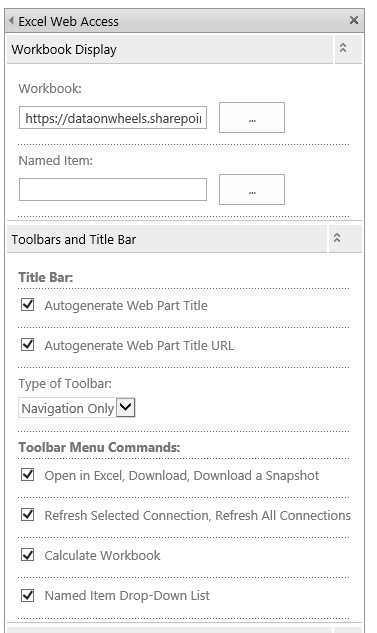 This is where i have to admit that i tried to use a parameter for this but ran into some Query Editor challenges with how Power BI creates a Sample File transform to import multiple files from a single folder. If you can see what i did wrong here I would love your feedback, but for now, you can ignore the file directory parameter in the Query Editor and need to go to “Advanced Editor” on the “AuditLog” query and modify the file location to be the location you are dumping files from the PowerShell script. Change the below file location as needed. Once you have made this change, you should be able to “Close and Apply” and your data will now be populated in this basic audit log analytics view. I created a couple basic pages to get this blog post shipped and so you can start taking advantage of the solution, but it is nowhere near as complete as you can eventually make it. I have a simple overview page that was screenshotted above. It can help you determine number of active users, reports, dashboards, and datasets being used for any time period your audit log data covers. The second page is a user activity view I created from a calculated table. 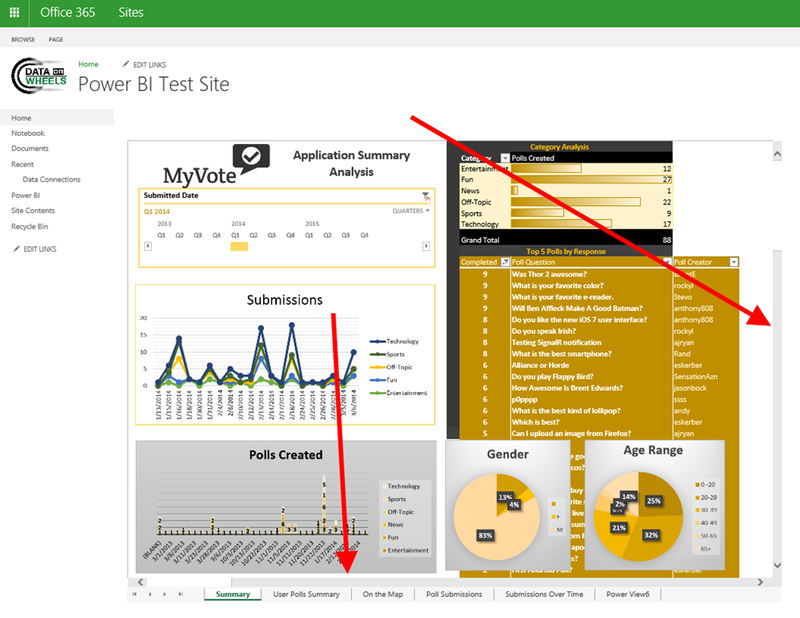 It helps you determine which users in the system may be inactive so you can re-assign power bi licenses and also shows detailed activity for an individual user that you can select from the slicer. With the most recent announcement of Power BI’s inclusion in the Azure Trust Center, it is a good time to review where we are today with Power BI security and compliance as it relates to various customer needs. I do a lot of work with financial, energy, and medical customers. These groups represent a large amount of compliance and regulation needs. I wanted to understand where we are today and this announcement is significant. This announcement shows Microsoft’s continued commitment to security and compliance in its cloud based products. While Power BI is not yet to the level of Office 365, some key compliance areas are now covered. I think the most significant compliance certification is HIPAA/HITECH which removes barriers related for the medical industry. As hospitals, insurance companies, and providers scramble to meet reporting demands from their customers and the government, Power BI gives them a flexible reporting and visualization platform to meet those needs. It will empower self-service in the organizations and departmental or enterprise collaboration with data. The HIPAA/HITECH certification will allow them to use the platform with more confidence and security. Beyond medical, more institutions will be able to rely on Power BI in a manner that is compliant and safe. As Microsoft continues this journey with Power BI and its other Azure based offerings, customers will be able to react more quickly to the changing business and regulatory environments with confidence in the security and management of their data. Even with this significant move by Microsoft, you are still responsible for implementing a secure, compliant solution. Microsoft is merely providing tools that are secure and will comply with regulations if implemented correctly. The key to a secure environment will always be you. 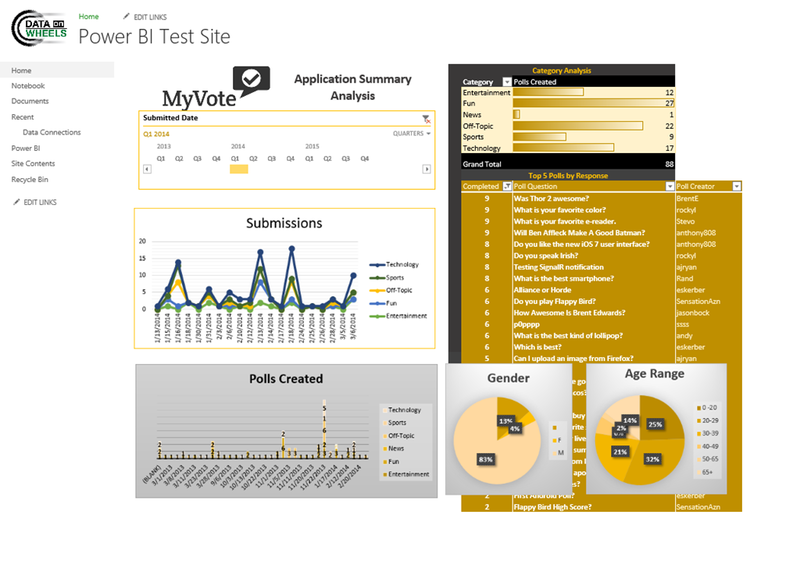 The data you use and analyze with Power BI is ultimately your responsibility. With a lot of the dashboard designs in Excel I work on, we often use CUBE formulas and other calculations and functions to get the data ready for the presentation area. 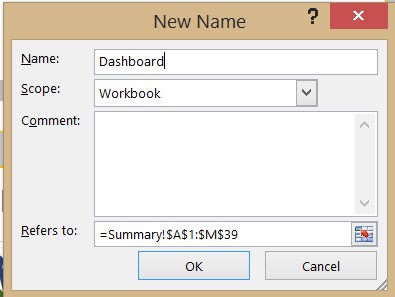 One of the key things we do is create a sheet in the workbook, or tab, that will allow you to hold this data. This allows us to refer to cells on the data tab in our visualizations without trying to support visualization techniques along with calculations. The most common scenario is when I want to present numbers in the visualization that are not in a pivot chart or pivot table. By keeping this in the data tab I have maximum flexibility in the visualization. Let’s look at the following example using Adventure Works data (from http://msftdbprodsamples.codeplex.com/). We will create the following “data box” visualization using a data tab. 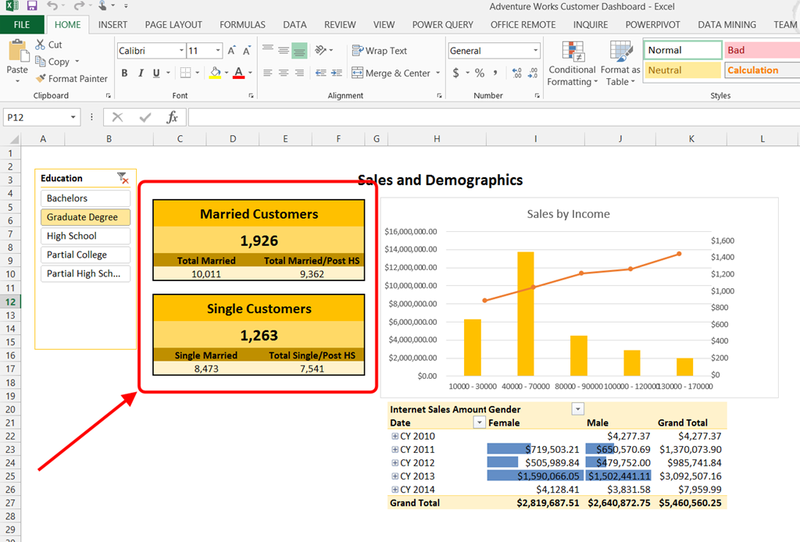 First, get the data into data sheet using a pivot table. 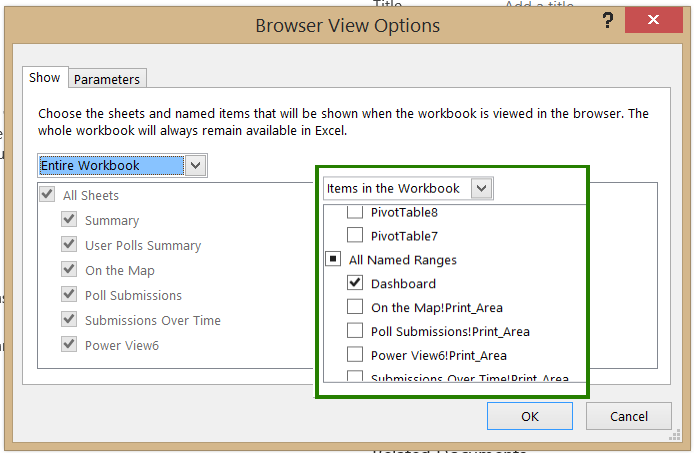 Once we have the data we want to present there, we flatten the pivot table (see Excel BI Tip #18 for details). Now we can refer to the fields we need using the data tab. In the following images you can see the data box referring to data on the data tab which uses the CUBE functions to get the data. As you can see, this allows us to contain a lot of data that is used for processing without cluttering up the visualization. 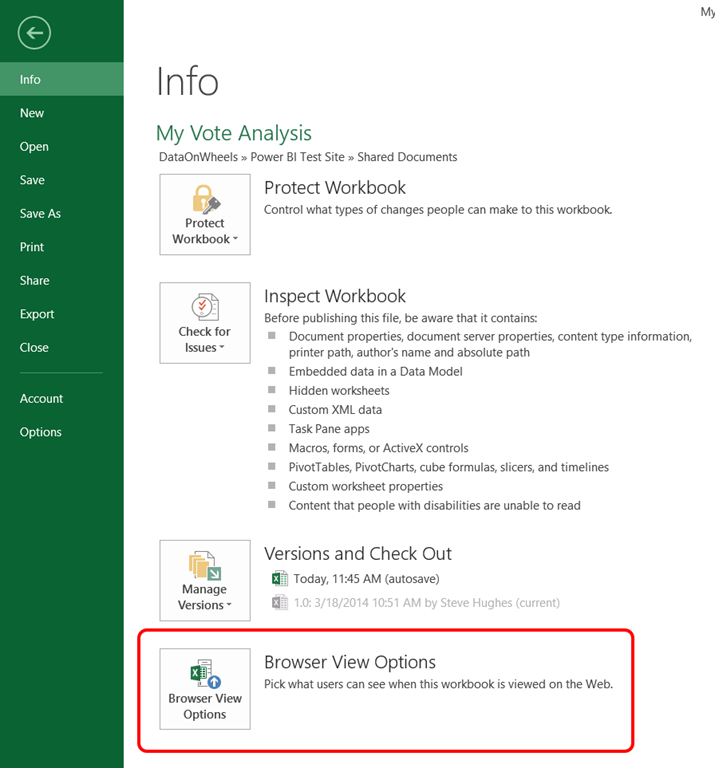 When used in SharePoint or Office 365, their is no impact to the visualizations which use the data sheet. While not visible or available to the user, the data sheet stills supports the visualization as expected. In scenarios I have delivered, this technique has allowed for extensive data manipulation and formatting to present data in meaningful ways. 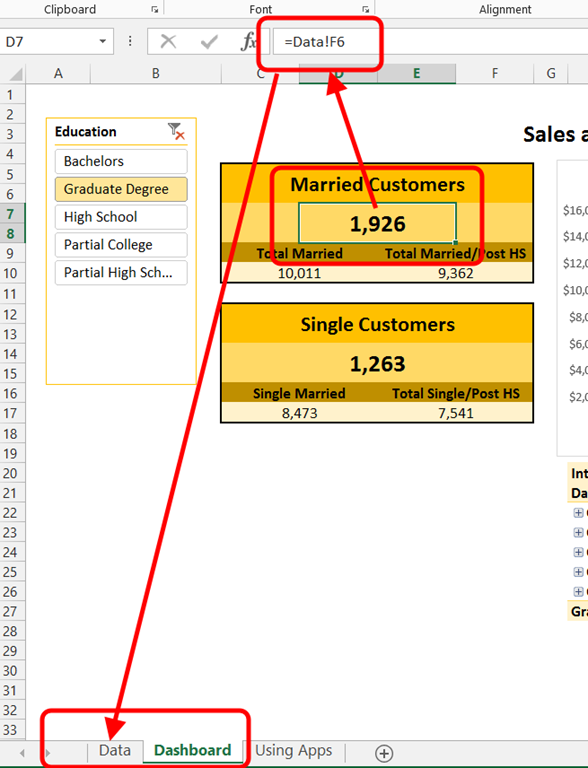 Excel supports a couple of options for overlaying lines on bars or columns. The most common method is to use the combo chart. In this option, you would put metrics into the chart and then select which is the bar and which is the line. This is particularly helpful when using different types of metrics such as counts and percentages. To set this up, you create the initial chart with the metrics you want and then change the type. 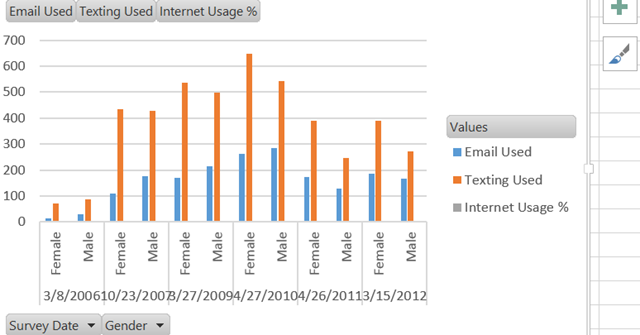 In the example below I have text and email usage counts with internet usage as a percentage in a column chart. 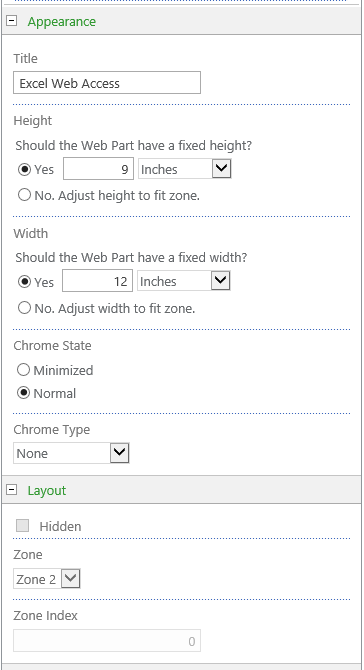 Select the Change Chart Type option on the PIVOTCHART TOOLS menu. In the dialog that is opened, choose Combo Chart at the bottom. 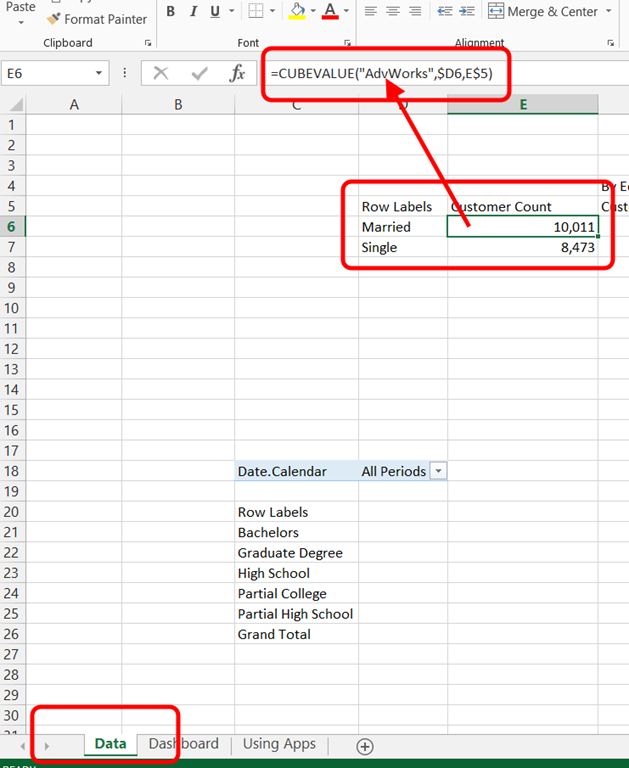 Excel will separate the values into lines and columns. In my case, it picked correctly, but be sure to check as it does not do what you want all the time. Because I am using percentages and counts, I want to have a secondary axis. My result is below. We can now look at percentages and counts in the same chart. This functionality can only be used with column charts and lines or areas. 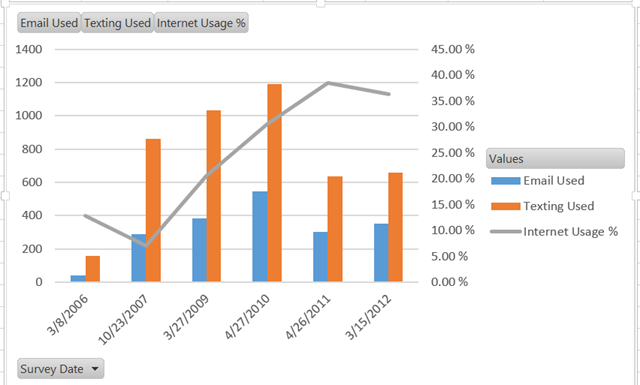 The value is being able to show two types of data on the same chart. 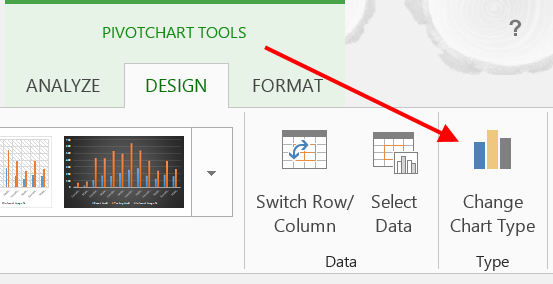 Up next, we will look at overlaying charts in Excel which gives you more design options for your dashboard.